Sretsis skirt, Jeremy Scott care label tee, American Apparel socks, Demonia white creepers. I have an obsession with the “Up in the Clouds” AW11 collection, it’s possibly my most favourite collection of theirs yet. Can I just say… the prints. THE PRINTS. Unicorns, rainbows, lambs, clouds, doves, deer *:･ﾟ✧ Absolutely gorgeous. The only downside is that I’m slightly broke?? (But it is completely and entirely worth it). Not to mention everything about the make is beautiful, and it has a dainty pink spotted lining I was showing off above. Even the label and the tags are beautiful! I’m ~officially~ on holidays now as I am 100% free. My holiday to-do list includes drawing, christmas shopping, getting a haircut, seeing friends, catching up on movies and TV, lots of DIY projects, and of course SLEEP! 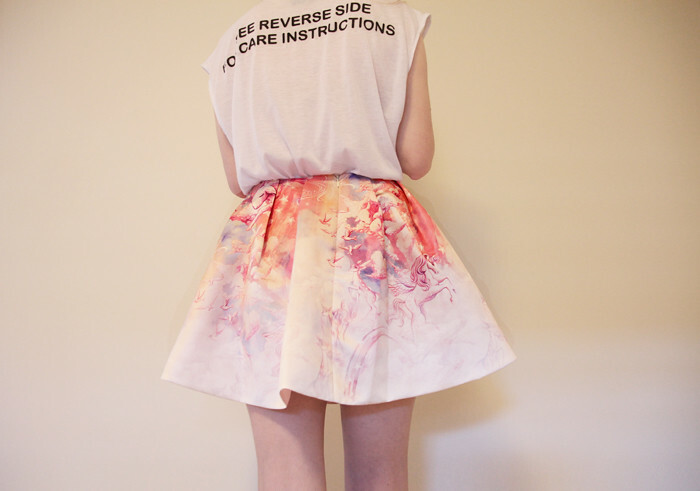 oh my, that skirt is amazing! wow! the skirt is aammazing and I love what you've worn with it. omg babe the skirt looks FABULOUS on you!! so jealous!!!!!! the print is to die for! I love that collection too! So jealous you got the skirt. I've been obsessing about this T too, since you've post it (yeah, I ALWAYS read your posts). Can you tell me where to get it? 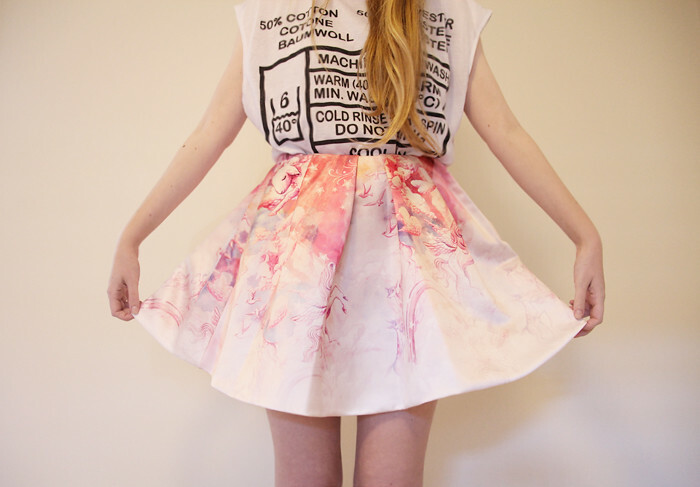 The skirt is so beautiful. The print is quite impressive. Damn Stretsis, that brand has released quite a few amazing pieces I wish I could afford. I just couldn't justify spending that much money on one piece now 🙁 which is a shame because some of their dresses are SO spectacular. Maybe if the job I just got wasn't such horrible pay. Oh, welcome to the Uni holidays club btw haha. Oh My GOD, why didn't I discovered you before?! It's totally perfect. I love it so much~ oh my lord. Omg I love this entire look so much! 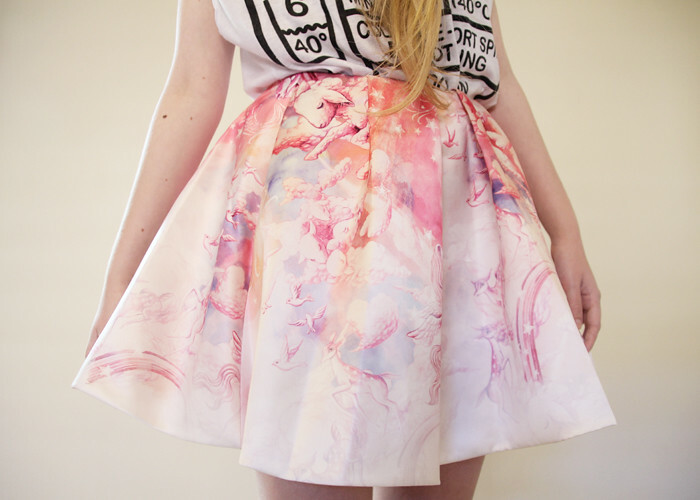 The skirt is so dreamy and beautiful!